Edward Teller's FBI file – Outlines years of FBI agents trying to establish whether or not he was the same person as another Edward Teller who taught at a Marxist school in New York. Edward Teller Biographical memoir of Teller by Freeman Dyson, released by the National Academy of Sciences. 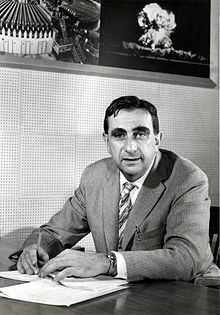 A radio interview with Edward Teller Aired on the Lewis Burke Frumkes Radio Show in January 1988. ↑ Hoddeson, Lillian (1993). "Setting up Project Y: June 1942 to March 1943". Critical Assembly: A Technical History of Los Alamos During the Oppenheimer Years, 1943–1945. Cambridge, U.K.: Cambridge Univ. Press. ISBN 0-521-44132-3. ↑ C. P. Wang (Ed. ), Proceedings of the International Conference on Lasers '85 (STS, McLean, Va, 1986). ↑ F. J. Duarte (Ed. ), Proceedings of the International Conference on Lasers '87 (STS, McLean, Va, 1988). ↑ "I have always considered that description in poor taste." Teller, Memoirs, p. 546.